Joining Manchester United is an unbelievable opportunity for me. I’m excited about working with José Mourinho and learning everything I can from such a successful coach. 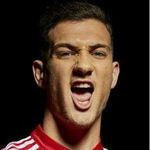 Diogo is an extremely talented young defender with all the qualities to quickly become a great player for this club. He has all the attributes that a full-back needs: physicality, tactical intelligence and technical quality, combined with a Porto Academy mentality which prepares players for the maturity they need at the professional level. Jose has talked him up big time. Wonder if he’ll start? Very much looking forward to seeing him play. Preferably with Alex Sandro occupying the other full back slot. And abracadabra, we have balance and ability to connect defense and attack. Young and Tony to develop into backup full backs over the course of the season. I'd assume he'll be bedded in slowly but if he keeps progressing at the rate people said he has been then he has a good chance of forcing his way into the starting XI soon enough. If we sign Alderweireld and Sandro his chances of breaking into the regular XI is better given their experience. It's highly doubtful Mourinho would want 3 or our back 4 to be 24 or under. I wouldn’t rule out him being used on the right wing at times, ahead of Valencia. He looks like a proper footballer. 1 - We were smart by being able to negotiate the terms with the player before Porto could renew his contract by a higher release clause. 2 - Being from Portugal, I can tell you this guy is a top prospect. It was a mistery for everyone why wasn't he part of Porto squad before, because he was by far the most talented player of his generation. Porto made two mistakes: the first was letting this guy too much time out of the senior squad and the second was not reviewing his contract after his first performances. You coult tell this guy was ready for professional football by his first appearances. 3 - I think he will become a starter sooner that expected: he's quick, strong, his fitness levels are amazing and he is a hardworker. I learned a massive amount from my time there. First of all, that a draw was not something that you considered as good. As a coach, that makes you grow. You have to win every game, and you work 24 hours a day towards that. Nothing else happens in your life. You cannot relax. You cannot. It is all about winning, and that pushes you, and makes you stronger. Really stronger. He have a clean left foot (and by that I meant two footed before someone have funny ideas...), almost natural even. Good clean left foot crosses. Based on short clips, which essentially is biased since it tend to only includes successful attempts, his performances at both sides are that good. The impressive part is his left attacking performances. Could see Mourinho playing him as LB and Tony RB in some games. 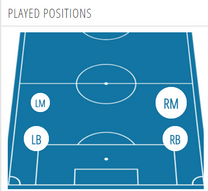 Seems more natural on the left back than Young. We'll see. Only seen Clips of him so cannot judge yet, but Mourinho has faith in him, it seems. As the summer progress and United, hopefully, sign a few more players I think Dalot will go under the radar. However, I have a gut feeling this lad will end to be one of the best signings. All the reports from Portugal are really encouraging, and I also assume that Mourinho got the Portuguese market under full control! Hopefully proves himself right away so we don't have to sit through Valencia for another season. Hope his injury doesn't prevent him from having a proper pre-season. Pity Ecuador haven't qualified for the WC. That would have given him a free run at the RB spot right of the bat whereas I still expect Valencia to start the season now. 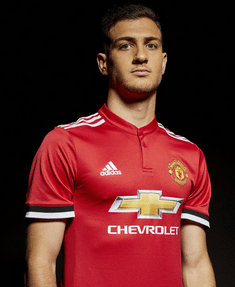 If Dalot impresses the manager in training and absorbs whatever instructions are thrown at him, he has a very good chance at becoming a fixture in the starting XI, IMO — especially considering he's positionally and tactically mature for his age, a fundamentally strong defender (which is oftentimes the biggest impediment in the path of young fullbacks), and fairly versatile to boot. "He's a great player and in 10 or 15 years when he becomes the new Maldini or Facchetti, with 200 or 300 Inter games under his belt, in that moment I'll remember his debut," Mourinho says. "In my view Santon is a right-back who can also play in midfield, principally in the position currently taken by Javier Zanetti. His versatility will be very important in his career. For example, Beppe Bergomi played as a centre-back, on the right or left and now Zanetti can play pretty much anywhere. All this is because they have character and confidence. "I believe an intelligent player knows how to adapt to different situations. Santon still needs to improve, obviously, and be a little less naïve at times. But these are details when discussing an 18-year-old who just needs to keep working hard." Looks comfortable dribbling/crossing with both feet on both sides going by clips. That's the feeling I have too. A lot of people are suggesting that he'll be backup to Valencia/Young and might start to hold down a position late in the season or next season, but my hunch is that he'll get there more quickly than that. Not that I really know him as a player But from everything I've heard, and looking at Valencia's limits, I can see it. Mourinho spoke very positively of him also. I know they always do that spiel at the start and say how great they are, but with him I genuinely believe it. He seems to be a very comfortable with the ball at his feet, The atmosphere shouldn’t bother him either. He’s played against Liverpool and did well, I think he could be ready pretty early. I have a Portuguese mate who support Porto. He was not keen on us signing Lindelof or Rojo but he's raving about this guy big time. He thinks Dalot is the most promising talent coming out from Portugal. Hah, the Caf won't give him a year or two. If he's not Roberto Carlos by Christmas he might as well be Ritchie de Laet. I couldnt give a monkeys what the superscouts on here think. I reckon he may go on to be a RW for us. I don't want to spoil your party, but in Portugal is quite common a Porto fan to dismiss players coming from Benfica or Sporting or vice versa. But in this particular case... I entirely agree with your mate, I will say this again and will repeat during the season. Valencia will be the main right fullback, he simply was signed based on potential, hopefully getting as many minutes of competition as possible. It will depend on his mental strength to react to a new reality where every mistake will be exposed, debated and how he reacts to that, reason why I think Mourinho will protect him during the season, not inserting him into the first 11 from the start. I don't think its the case though. He's quite balanced in his argument. In fact he thinks Gelson Martins is the second most promising player in Portugal and very close to Dalot on that matter. Next year Valencia will start as our first teamer. I don't think it will end that way though. Im so hyped for this guy, a cracking prospect by the looks and sounds of it. Hopefully he got that attitude and mentality to take the next step. Then again as a Sporting fan I can tell you I see Dalot as a United player, Gelson at best can be a Everton style of player, even rate more Bruno Fernandes than him. What he told me is that he's got that Nani sort of unpredictability in him. He might end up becoming the new Ronaldo as much as he can easily become the next Quaresema. Dalot is more of a safer bet. I am being a parrot here. I don't have enough personal knowledge to give my own opinion on them. So please don't shoot the messenger. All I am saying is that I am basically relaying what its being said to me. For all I know these players might be totally championship level and what I am posting is absolute gibberish. No he probably offered a balanced insight, only my opinion Nani with the same age as Gelson was better, nothing wrong regarding your opinion. This would be very boring if everyone said the same stuff. Hopefully nothing serious with the knee surgery or injury or whatever is causing him to walk around in crutches. Expected to be ready for the tour. Better he's injured now than the start of the season. You cannot be sure. Exactly the same was said about Verane at Madrid. Everyone believed he would hardly have games ahead of Pepe. But Jose surprised everyone by putting him ahead of Pepe. He only started to play Varane ahead of Pepe when his relation with the players deteriorated, same thing when he replaced Casillas with Diego Lopez.